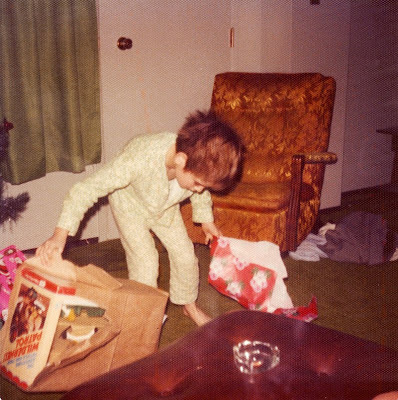 On Christmas morning in 1976, I opened up one of my favourite gifts: the Fisher-Price "Wilderness Patrol" Adventure People set. The set included everything an imaginative child could possibly need to create wild adventures from bits of inanimate plastic. "Wilderness Patrol" presented an embarrassment of riches. 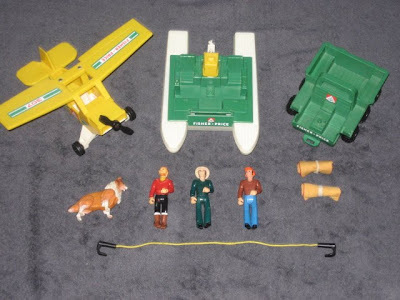 There were four action figures: a collie, a pilot, a forest ranger, and a woodsman-type guy I called "Red." There were three cool vehicles: an airplane for the pilot, a pontoon boat, and an ATV. The pontoon boat and the ATV both floated, and even cooler, you could attach the airplane to the pontoon boat. Even a climbing rope and a pair of sleeping bags were included, although looking back I wonder why there were only two sleeping bags for three men. Perhaps one of the men was expected to sleep with the dog for warmth. I played with these toys for years. They were durable, colourful and versatile. I had great fun floating the ATV and the pontoon boat in the puddles and streams of Leaf Rapids, or taking them all out for "desert adventures" on the sand dunes behind the Acklands store that my dad managed. The men of the Wilderness Patrol often teamed up with other action figures, fighting Stormtroopers and Cylons alongside Luke Skywalker and Han Solo. But as with all boys, there came a day - shortly after I turned 13, I think - when I realized that action figures weren't cool anymore, that they were for little kids, and that it was time to move on to more sophisticated pursuits: baseball and board games, Atari and long afternoons at the Leduc Public Library. Eventually, when my friends and I were bored, the Adventure People and their action figure brethren became targets of abuse, worth nothing more than a few moments of destructive amusement. Poor Red was thrown into the whirling blades of a lawnmower, but he was tough and suffered only a few shallow gashes and a chunk of his scalp. Other figures weren't as lucky, rolled down playground slides and staircases to lose heads and limbs. Most were simply forgotten in old cardboard boxes and, I assume, carried off to charities or the junkyard by my parents. I wish now that I'd been more considerate, that I'd recognized the immense value of these mass-produced trinkets. For they represented, first and foremost, the love of my parents, whose first goal was always the happiness of their children. And they helped me create miniature worlds, places where I couldn't go in the flesh; they were my avatars, and I'm grateful for the adventures we shared. I always wanted that set. I had the rescue helicopter myself: two orange-suited dudes, and a helicopter where the rotors actually spun under the inducement of a trigger under the rear tail boom. Yes, those figures, and others like them, gave my staid childhood it's adventure, in a slightly more tangible way than the books I consumed. I had the pontoon boat! It's still around, as a matter of fact. My mom and dad have a box of my old toys that they bring out when my family and I visit. Aside from a few peeling decals, it's still very playable. Probably made with lead paint and lots of tasty CFCs, but it's playable.